Disclaimer: I received this ARC from Netgalley free in return for providing my honest and unbiased review. Two Sentence Summary: Not sure I really need to do this, since it’s based off of Shakespeare’s Macbeth, but here goes. Macbeth takes place somewhere in Scandinavia in the 1970s. In this version Macbeth is the team leader of a SWAT team and a recovering drug addict. He seeks to become the Chief of Police, and will stop at nothing to fulfill a prophecy; that seems to be brought to him by three Chinese prostitutes. 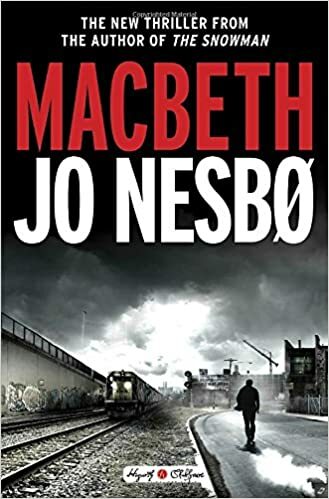 I really like Jo Nesbo and I like Shakespeare. Honest, I do, but this retelling of Macbeth crashed and burned before it even got off the ground. I got to end of Part I where Macbeth kills Duncan and called it quits. Just to give you a little more perspective the book is 512 pages and I read 1/4 of it, that’s about a 130 pages. I couldn’t. I just couldn’t bring myself to read anymore. Scandinavian Noir is a favorite genre of mine. I got hooked on it after reading Steig Larsson’s The Millennium Trilogy. The first book I ever read by Nesbo was The Bat. It was the first in the Inspector Harry Hole series and it was good. Not great, but good and I could see that there was a lot of potential in this writer. And like good wine he’s gotten better with age, but also like good wine from time-to-time there will be a few sour grapes out there. And well, this is what we have with this retelling. In a nutshell I found it rather boring and excruciatingly verbose. I’m pretty sure that it could have been half it’s length. It felt like Nesbo introduced all the characters in Part I and it was really overwhelming to me. There were bits that felt rushed and then it was like Nesbo said, ‘Oh, I need to slow this down.’ And that’s when he took being a wordsmith to a new level. I really am struggling to find something good to say about what I did read. What I will say is that I did enjoy the imagery. If anyone out there read this retelling, please let me know what you thought and if I should give it another go.